Call 800-660-7238 to Book a Whitewater Rafting Trip Today! 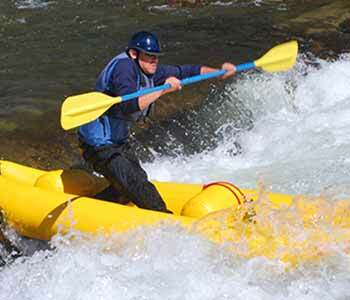 Geo Tours offers whitewater raft trips on three of Colorado’s favorite rivers and every level of FUN from leisurely float trips to heart-pounding whitewater. 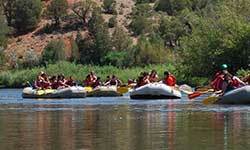 Part-day & All-day trips on Clear Creek are easy to access from Geo Tours and Denver, Colorado. While All-Day & Multi-Day trips on the Upper Colorado and Arkansas rivers require a bit more travel. Depending on how much time you have, we’ve got the trip you are looking for. 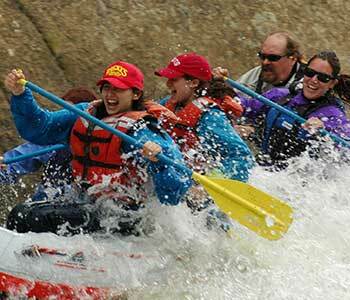 Geo Tours Denver has been putting the FUN in rafting adventures since 1981 and is celebrating it’s 39th year under the same management. We are a small, locally owned white water colorado rafting company and that’s just the way we like it! Our size allows us to provide you with a personalized whitewater rafting experience. Geo only uses state of the art equipment and places a highest priority on customer safety. We are not just thrill seekers, but fun-seekers with an eye always on safety. Geo Tours is headquartered, just 20 minutes from Downtown Denver, in the small town of Morrison, Colorado. Morrison is easy to get to from anywhere in the Denver Metro Area. Morrison is located 3.3 miles south of Interstate 70 at Exit 259 or just west of C-470 at the Morrison Road Exit. Meet us in Morrison or at the river put-in. We are close to the Clear Creek put -in. Geo Tours can arrange transportation for those wishing to meet up in the Metro Denver Area. 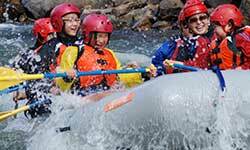 Give us a call and let’s work out the details for your Colorado white water rafting trip. April snow pack amounts are currently well above Average/Normal, in Colorado! Although we can expect change out of Mother Nature in the coming months, this is a strong indicator for good water levels this coming summer. Daily Rafting operations are scheduled to begin May 20th. Contact Geo at 800-660-7238 to make a reservation or with questions you have about future trips. 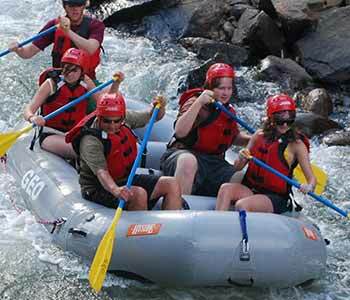 (Class III to IV+) is located near Idaho Springs, Colorado, minutes from Geo’s Morrison base, Clear Creek is the closest “true” whitewater rafting to Denver. Half-day morning or afternoon rafting runs available. 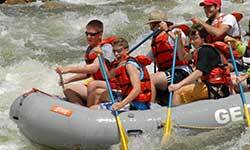 (Class III to IV) – Geo Tours has been running raft trips on the Arkansas River since the early 1980’s and maintains an excellent safety record. 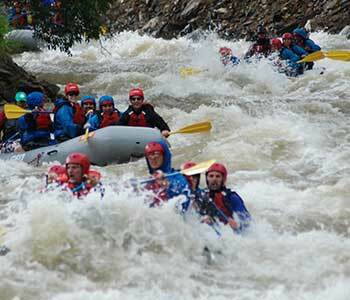 All raft trips launch in or near Buena Vista, Colorado. (Class I to III) boasts picturesque canyons and valleys, easily accessible from Denver because we do the driving! 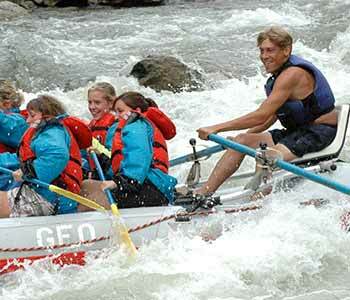 We offer 1-Day, Overnight, 2-Day, 3-Day, and 4-Day rafting expeditions for all ages. 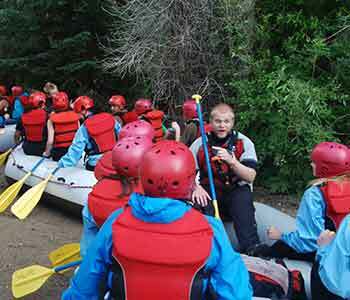 Your choice of adventures include Paddle Raft where you help control your raft and assist the guide, or you can sit back in an Oar Raft and enjoy the rapids while your guide does most of the work. Inflatable Kayaks are also available on some stretches. Certain options may be unavailable on specific trips or in times of high water conditions. 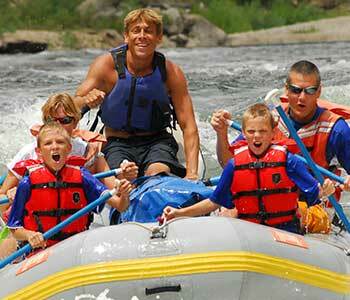 Call us today @ 800 660-7238 to book your whitewater rafting trip. Our staff will guide you through all the things you need to help you get the most out of your rafting trip. Winner of a Gold Star Certificate from BBB Denver/Boulder, 2014 – for having no complaints in a three-year period. Be In-the-Know, Before You Go!